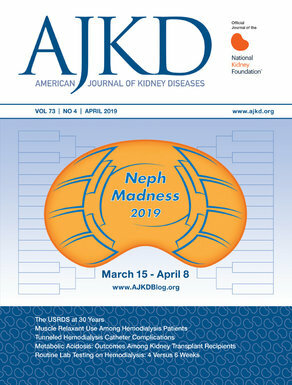 In a recent article published in AJKD, Thamer at al did a retrospective observational investigation of the ESA prescribing patters before and after publication of the TREAT trial, and even referred to TREAT as a “watershed” study. As erythropoietin rose to popularity, there was general agreement that blood transfusions are not indicated for Hgb > 10 g/dL, and that blood transfusion should be reserved for when Hgb is < 7-8 g/dL (Murphy et al; Carson et al) depending on patient characteristics. The most recently published guidelines from the AABB (formerly the American Association of Blood Banks) are based on a systematic review of randomized, controlled trials (TRICC, TRIPICU, and FOCUS ) evaluating transfusion thresholds. These guidelines recommend adhering to a restrictive transfusion strategy (Hgb < 7-8 g/dL) in most patient populations. This restrictive strategy projected a decrease in RBC transfusions by an average of approximately 40% (RR. 0.61, CI 0.52-0.72), which would potentially have a large effect on blood use and the risks for infectious and noninfectious complications of blood transfusion. Two decades later (2009), the TREAT Study was published. The TREAT investigators concluded that “the risk (2-fold higher incidence of complications, e.g., strokes, cancer deaths in those with underlying history of malignancy) of using ESAs in CKD patients with moderate anemia who were not receiving dialysis will outweigh the potential benefits.” This paved the way to a somewhat radical shift in practice, whereby a hemoglobin of < 9 g/dL is now the threshold for recommending treatment with ESAs. This has been echoed in the KDIGO Anemia Guidelines, and in a commentary from the KDOQI Work Group. In this AJKD study, Thamer at al show that although publication of TREAT was followed by a marked decline in the use of ESAs, the use of blood transfusions did not significantly change. This is the first study to document anemia prescribing patterns before and after TREAT. Thamer et al identified 350,955 stage 3 CKD and 193,377 stage 4 CKD claims in the 2 years prior to publication of TREAT and 450,330 stage 3 CKD and 230,519 stage 4 CKD claims in the 2 years after publication of TREAT. The authors suggest that after the publication of TREAT there was a marked decline in the use of ESAs, whereas, the use of blood transfusions did not change signiﬁcantly. The authors also suggest that the decline in ESA prescribing in the 2 years prior to the October 2009 publication of TREAT likely resulted from a variety of factors, e.g., a number of regulatory and reimbursement measures to restrict ESA use, including an FDA black box warning issued in March 2007. This decline accelerated after publication of TREAT. In the ESA-prevalent population, a marked decline in ESA use can be seen after June 2011, at which time safety concerns and TREAT ﬁndings prompted the FDA to remove the erstwhile hematocrit target range of 30%-36% and advise physicians to “reduce or interrupt the dose” of ESAs if hematocrit falls below 33%.